McElligott: "It's The Steepener, Stupid"
In his comment from yesterday, Nomura's Charlie McElligott highlighted several key ways in which the latest rout in interest rates has been different from previous episodes, most notably that of January 2018: the first key difference was the lack of rate vol, which however has been picking up over the past two days; the second difference was the inflection from "bear flattening", which defined the yield curve for much of 2018, to "bear steepening" and which is sending an important message for stocks, as "it’s this upgrading of R-star / neutral rate which is re-pricing the long-end of the curve." This morning, in his latest note to clients with the 10Y yield just above 3.20% and moments ahead of the payrolls report, the Nomura cross-asset strategist noted that global yield curves have continued the grinding “bear-steepening” overnight (JGB 2s30s @1.5 year highs, Bund 2s10s at 5m highs) — and as anticipated for months, "it’s the steepening which is the ultimate indicator of potential macro regime inflection and the driver behind the (nascent) cross-asset volatility spike, especially due to the jarring violence of Wednesday’s Rates selloff." However, as he explained yesterday, the current selloff remains different - for now - in that unlike his “mid-2019 “risk-off” steepening scenario, McElligott views the steepening as not being caused by the market “sniffing a slowdown” (and repricing hikes “out of”/rallying the front-end), but instead it’s the sudden repricing (higher) of U.S. economic growth via “hot data”—and slowly-but-surely, U.S. inflation expectations as well—which is “selling-off” the long-end. This is also the result of repricing r-star higher, and now pricing in a cycle high 60bps of hikes in 2019 (up from 57.5bps yesterday). While the above makes sense theoretically, at least as long as the data keeps coming in hot and forcing the Fed to keep hiking, it also has practical implications for the market: specifically, according to Nomura, this "positive shock" and "bear steepening" is the catalyst for the “Momentum” factor unwind, which corresponds with the reversal in the Growth/Value ratio, as “Long Growth”/“Short Value” has been de facto positioning and “the” performance driver for the last two + years. There is also a technical factor, in the form of CTA exposure. 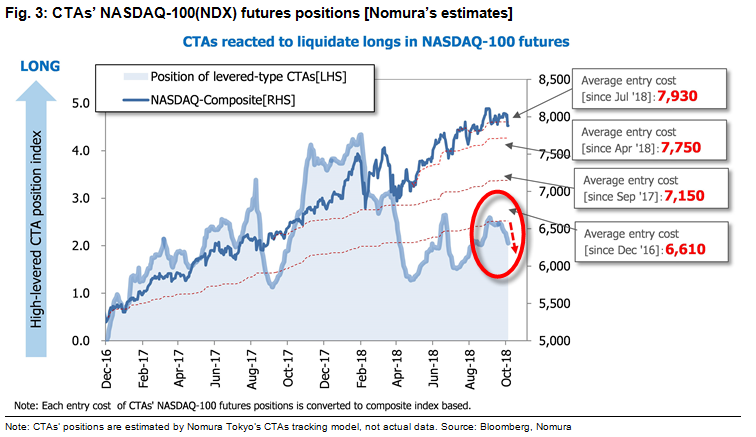 Nomura's latest CTA model indicates that systematic-trend funds were "at- or near- deleveraging "triggers" as SPX 2m and 1m windows “flipped,” creating substantial notional which was “unemotionally” sold—S&P emini contract volume at 2x the 20d avg, with notional traded in Spooz a massive $309B—a six month high." Such trigger point were said to be found just around 2,890; should this level be taken out, it is likely that the CTA community will promptly deleverage aggressively. The good news is that unlike human traders, who focus on small changes in narrative and trendlines, the machines will only unwind once they see other machines do the same. As the Nomura strategist concludes, if we can maintain strong growth trend without inflation (not “too hot”), "goldilocks" parties-on and broad stocks likely relief rally (“Growth” stocks likely get their legs again), with Treasuries also stabilizing (somewhat) as well. However, another surprise beat in AHE - which however will only come one month from today the earliest - would further stoke that “wage inflation” story "would likely reaccelerate the repricing U.S. Rates (belly to long-end), keeping pressure on “consensual” U.S. Equities positioning" amid more rotation “out of Growth, into Value” (as witnessed MTD)—and would likely supercharge McEliggott's “Long Cyclicals (Financials / Banks esp) / Short Defensives” trade, which we discussed here. Luckily there were no overheating "surprises" in recent weeks and months. 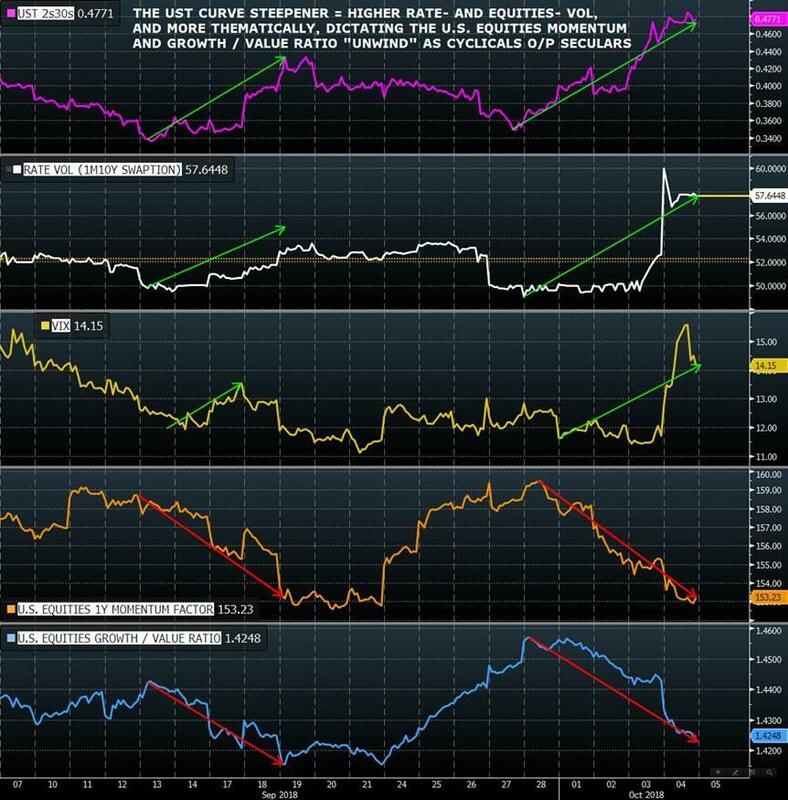 Putting all of above observations by McElligott, "he notes that going forward a “rogue inflation beat” without a doubt is the largest “risk-off” threat to risk-asset psyche, as it disrupts the current “steady” pace of normalization and would pivot the “risk-positive” narrative from “growing faster than we are tightening” (GDPNow at 4.1%) to then risking “Fed policy error” due to “over-tightening risk” and thus, “pulling forward” the end of the cycle." Meanwhile, as Charlie touched above, as the curve continues to steepen, we are seeing a rotation of value stocks into a position of strength vs "secular growth." 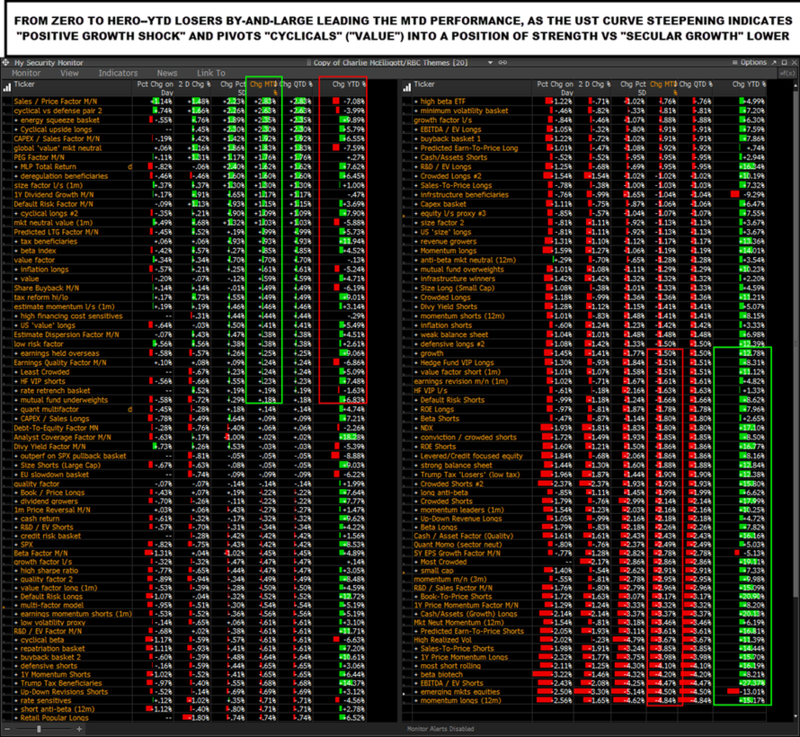 Last but not least, here is indication of exposure/length by systematic funds which are liquidating longs in the Nasdaq 100 future amid the yield-curve steepening spillover.